Purpose: To evaluate the efficacy of the bone augmentation procedure at dehiscence or fenestration defects in one-stage implant insertion and to evaluate which is the most effective procedure. Materials and methods: A systematic review of articles selected from MEDLINE, Cochrane Central Register of Controlled Trials (CENTRAL) and Google Scholar was performed. Additional studies handsearched and found in printed versions of the principal dental implant journals were included. Only randomised controlled trials (RCTs) were included. Outcome variables considered were implant failure, complications, aesthetic and functional satisfaction, complete fill of the defect, clinical and radiological bone level variation, and vestibular peri-implant recession. Independent data extraction by two authors using predefined data fields, including study quality indicators, was completed. All pooled analyses were based on random effects models. Results: A total of 65 full-text articles were examined in detail. Forty-six of the 65 articles did not meet the inclusion criteria. Nineteen articles involving 15 trials were identified for inclusion in the review. Only one study was considered to be at a low risk of bias. The included studies involved 396 patients and 535 implants. Comparing the test group using membranes with the control without membranes, a statistically significant difference was obtained for vertical variation of the peri-implant defect; the difference was 1.64 mm (three RCTs, 95% CI from 0.47 to 2.80 mm; P = 0.006, I2 = 0%) favouring the use of a membrane. Non-resorbable polytetrafluoroethylene (ePTFE) membranes obtained a complete clinical fill of defects more frequently than resorbable polylactide/polyglycolide (PLGA) membranes. The odds ratio was 0.15 (two RCTs, 95% CI from 0.04 to 0.64 mm; P = 0.01, I2 = 0%), favouring the use of ePTFE membranes. No differences were observed comparing nonresorbable ePTFE membranes and resorbable collagen membranes. The comparison between crosslinked membranes and collagen native membranes yielded a very high heterogeneity for vertical variation of the peri-implant defect (two RCTs, I2 = 91%, P = 0.001). Dehiscence complications were more frequent using cross-linked membranes but the odds ratio was not significant (three RCTs, odds ratio 0.44, 95% CI from 0.18 to 1.10; P = 0.08, I2 = 4%). Conclusions: Overall, the evidence is not sufficiently robust to determine if any treatment is needed and which is the best treatment for dehiscence or fenestration defects at one-stage implant placement. Only 15 trials were included and the majority are of limited sample size, have short follow-ups as well as having a high risk of bias. The use of a membrane can contribute to the regeneration of the hard tissue in horizontal one-stage augmentation. The complete fill of the defect was obtained more frequently when a non-resorbable ePTFE membrane was used compared to a resorbable PLGA membrane. No differences were observed comparing non-resorbable ePTFE membranes and resorbable collagen membranes. No substantial differences were obtained using different non-resorbable membranes and grafts, and the results were positive for the variables examined. A high result of heterogeneity was observed in studies dealing with cross-linked membranes. Purpose: To evaluate whether 4.0 x 4.0 mm dental implants could be an alternative to implants at least 8.5 mm long, which were placed in posterior jaws, in the presence of adequate bone volumes. 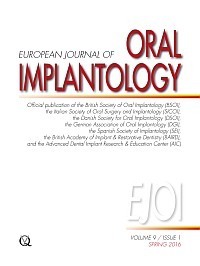 Materials and methods: One hundred and fifty patients with posterior (premolar and molar areas) jaws having at least 12.5 mm bone height above the mandibular canal or 11.5 mm below the maxillary sinus, were randomised according to a parallel group design, in order to receive one to three 4.0 mm-long implants or one to three implants which were at least 8.5 mm-long, at three centres. All implants had a diameter of 4.0 mm. Implants were loaded after 4 months with definitive screwretained prostheses. Patients were followed up to 1-year post-loading and outcome measures were prosthesis and implant failures, any complications and peri-implant marginal bone level changes. Results: Seventy-five patients were randomly allocated to each group. One patient dropped out after the 4-month post-loading evaluation from the long implant group. Up to 1-year post-loading, 3 patients lost one 4.0 mm-long implant each in comparison to 2 patients who lost one long implant each (difference in proportion = 0.013; 95% CI: -0.058 to 0.087; P = 0.506). All failures occurred before loading, the failed implants were replaced and the delivery of two prostheses in each group was delayed for several months (difference in proportion = 0.0004; 95% CI: -0.068 to 0.069; P = 0.685). Three short implant patients experienced three complications versus 2 long implant patients (difference in proportion = 0.013; 95% CI: -0.058 to 0.087; P = 0.506). There were no statistically significant differences in prosthesis failures, implant failures and complications. Patients with short implants lost on average 0.53 mm of peri-implant bone and patients with longer implants lost 0.57 mm. There were no statistically significant differences in bone level changes up to 1 year between short and long implants (mean difference = 0.038 mm; 95% CI: -0.068 to 0.138; P = 0.198). Conclusions: One year after loading 4.0 mm-long implants achieved similar results as 8.5 mm-long or longer implants in posterior jaws, however 5- to 10-year post-loading data are necessary before reliable recommendations can be made. Purpose: To compare the clinical outcome of dental implants restored with definitive occluding partial fixed prostheses within 1 week, after implant placement with immediate non-occluding provisional restorations, which were to be replaced by definitive prostheses after 4 months. Materials and methods: Fifty partially edentulous patients treated with one to three dental implants, at least 8.5 mm long and 4.0 mm wide inserted with a torque of at least 35 Ncm, were randomised in two groups of 25 patients each, to be immediately loaded with partial fixed prostheses. Patients of one group received one definitive screw-retained metal-ceramic prosthesis in occlusion within 1 week after placement. Patients of the other group received one non-occluding provisional acrylic reinforced prosthesis within 24 h after implant placement. Provisional prostheses were replaced after 4 months by definitive ones. The follow-up for all patients was 4-months post-loading. Outcome measures were prosthesis and implant failures, any complications, peri-implant marginal bone level changes, aesthetic evaluation by a clinician, patient satisfaction, chair time and number of visits at the dental office from implant placement to delivery of definitive restorations. Results: No patient dropped out. Two immediately occlusally loaded implants with their related definitive prostheses (8%) failed early (difference in proportions = 0.08; 95% CI: -0.03 to 0.19; P = 0.490). Four complications occurred in the occlusal group versus one in the non-occlusal group; (difference in proportions = 0.12; 95% CI: -0.04 to 0.28; P = 0.349). Four months after loading, patients subjected to non-occlusal loading lost an average of 0.72 mm of peri-implant bone versus 0.99 mm of patients restored with occluding definitive partial fixed prostheses. There were no statistically significant differences for marginal bone level changes between the two groups (mean difference = -0.27 mm; 95% CI: -0.84 to 0.30; P = 0.349). The differences for aesthetic scores showed no statistical significance (8.26 versus 7.58; P = 0.445); the same was seen for aesthetics evaluated by patients (Mann-Whitney U test: P = 0.618). Patients in the non-occlusal group were significantly more satisfied with the function of their implant-supported prostheses (Mann-Whitney U test: P = 0.039). Significantly less chair time (mean difference = -28.4 min; 95% CI: -48.82 to -7.99; P = 0.007) and the number of visits (mean difference = -1.88; 95% CI: -2.43 to -1.33; P < 0.001) were required for the immediate definitive prosthesis group. Conclusion: This study did not provide a conclusive answer but may suggest that provisional prostheses non-occlusally immediately loaded may increase patient functional satisfaction, chair time and the number of visits, with respect to definitive prostheses immediately loaded in functional occlusion. Purpose: To evaluate whether a low-dose subperiosteal anaesthesia is effective in minimising risks of inferior alveolar nerve damage at implant placement when compared to high-dose infiltration anaesthesia. Material and methods: One hundred and twenty patients requiring the placement of a single implant in order to replace a missing first mandibular were randomly allocated to two groups: group A (awake hemilip) subperiosteal crestal injection equal to 0.9 ml of articaine with 0.5% epinephrine and group B (numb hemilip) infiltration equal to 7.2 ml of articaine with 0.5% epinephrine in the vestibular fundus. Intraoperative sensory control using sensory tests was carried out in all patients. Outcome measures were neurological complications, intraoperative and postoperative visual analogue scale (VAS) scores for pain and swelling, and a questionnaire evaluating patient satisfaction. Patients were followed for 1 week postoperatively. Results: There were no cases of nerve injury. Seven days after surgery the postoperative VAS score for pain and swelling was lower in group A in a statistically significant manner (difference = -3.41%; 95% CI: -5.57, -1.26; P = 0.002 and difference = -3.33%; 95% CI: -5.41, -1.25; P = 0.002, respectively). Conclusions: No nerve damage occurred using either anaesthesia types, therefore the choice of type of anaesthesia is a subjective clinical decision, however it may be preferable to use a low dose (0.9 ml) of subperiosteal anaesthesia, since it is unnecessary to deliver 7.2 ml of articaine to anaesthetise a single mandibular molar implant site. Purpose: To evaluate the clinical outcome of fully edentulous patients rehabilitated with immediately loaded bimaxillary screw-retained metal-resin prostheses supported by five implants placed flapless: two in the mandible and three in the maxillae. Materials and methods: Twenty-five consecutively treated patients were recruited. To be immediately loaded, implants had to be inserted with a minimum torque of 80 Ncm. Outcome measures were prosthesis and implant failures, and complications. Results: Six months after loading no patients dropped out and no prosthesis or implant failed. Two maxillary prostheses were loaded early at 8 weeks because implants were inserted with a torque inferior to 45 Ncm. Three complications occurred in two patients but they were all successfully treated. Conclusions: Six months after loading, immediately loaded bimaxillary cross-arch prostheses can be supported by only two mandibular and three maxillary flapless-placed dental implants. Longer follow-ups of approximately 10 years are needed to understand the prognosis of this treatment modality. Purpose: This study aims to verify the effect of hypercholeresterolaemia on implant and bone augmentation failures. Materials and methods: A retrospective cohort study was conducted on 268 sequential patients scheduled for implant and bone augmentation surgery under conscious sedation in a private practice. Total serum cholesterol (TC) levels were assessed via blood tests before surgery. Patients were divided into two groups: TC < 200 mg/dl and TC > 200 mg/dl. A 6-month post-loading follow-up was scheduled both for implants and grafts. The outcomes considered were implant failure (removal) and graft infection/failure. The effect of cholesterol on early implant and grafting failure was investigated according to a logistic regression model. Results: Two hundred and twenty-seven patients fulfilled inclusion criteria; 139 had hypercholesterolemia. The 6-month post-loading overall implant failure rate was 6.25% at patient level (2.00% at implant level). Partial or total graft infection rate was 10.2%. High TC increased by 7.48 times the odds of the grafting failure (P = 0.047; 95% CI: -0.94 to 59.23), whilst it did not modify the odds of implant failure (P = 0.749; 95% CI: 0.28 to 2.49). Conclusions: High total serum cholesterol levels tend to increase graft failure rates whilst it did not influence implant failures. Purpose: To investigate the outcome of immediate function of dental implant rehabilitations in diabetic patients with and without coexisting cardiovascular diseases (CVD). Materials and methods: This retrospective study included 70 diabetic patients (33 females and 37 males, average age: 59 years old), rehabilitated with 352 implants and divided into two groups (CVD: 38 patients; non-CVD: 32 patients). Diabetes mellitus was defined as fasting plasma glucose ≥ 7.0 mmol/l (126 mg/dl) or 2 h plasma glucose ≥ 11.1mmol/l (200 mg/dl). The data was retrieved from patient records. Primary outcome measures were prosthesis and implant survival; secondary outcome measures were marginal bone loss and complications (biological or mechanical). The follow-up was 5 years after loading for all patients. Results: Seven patients (10%) were lost to follow-up (one patient in the CVD group; and six patients in the non-CVD group). One prosthesis failed in the non-CVD group, rendering a 97.4% survival rate, compared to 100% in the CVD group (non-significant difference between groups; P = 0.359). Ten implants failed in 7 patients: CVD group with eight implant failures in 5 patients (86.7% cumulative survival rate) versus two implants in 2 patients in the non-CVD group (93.8% cumulative survival rate) with a non-significant difference between both groups (P = 0.365). The average (95% confidence interval) marginal bone loss at 1- and 5-years was 0.95 mm (0.66 mm; 1.23 mm) and 1.52 mm (1.20 mm; 1.88 mm), respectively in the CVD group; and 0.78 mm (0.40 mm; 1.16 mm) and 1.54 mm (0.86 mm; 2.31 mm), respectively for the non-CVD group; with no significant differences between groups at 1 year (P = 0.979) and 5 years (P = 0.300). Complications occurred in 38 patients (CVD group: 21 patients; non-CVD group: 16 patients); with a non-significant difference between both groups (P = 0.660). Conclusions: Implant rehabilitations represent a valid treatment for diabetic patients with or without coexisting CVD, with a good risk/benefit ratio. This section presents a brief review of articles on dental implants considered of special interest for the reader, in order to encourage the development of research, the interest for data analysis and the attention given to scientific publications. Your comments are welcome. Please contact Dr Michele Nieri at: michelenieri@gmail.com.